With over 10 years experience in State and Federal Court litigation in South Florida, attorney Michael Reitzell is a proven and aggressive advocate. If you are an individual who has been injured in an accident through no fault of your own, or if you have a family member who has been seriously injured or killed in an accident, call Mr. Reitzell. He will champion your rights and guide you through the legal system. If the at-fault driver has insurance, then in most cases that driver will be provided with an attorney by the insurance company to protect the insurance company's rights. In order to fight for your rights against the insurance company lawyers who are protecting that at-fault driver, you must hire your own attorney to fight against the insurance company lawyers. Call the Law Offices of Michael P. Reitzell, P.A. in order to protect your rights. There is no fee if there is no recovery. 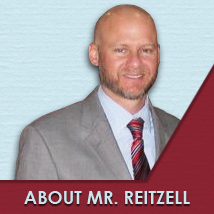 From the beginning of the case to the end, Mr. Reitzell will guide you through the Court system and advocate for your rights. If you are in need of representation in order to protect your legal rights, call Mr. Reitzell at (561) 478-4001 for a free consultation. Visit our contact us page. Now representing a number of individuals and companies in various forms of litigation, Mr. Reitzell focuses his practice on civil litigation including: personal injury claims, automobile accidents, premises liability, Wrongful Death claims and professional liability. Mr. Reitzell also represents clients in bankruptcy filings and litigation. CONFIDENTIALITY NOTE: All case analyses and legal consultations with the Law Offices of Michael P. Reitzell are kept strictly confidential.